Some of us may feel that we cannot contribute financially to the parish because what we can give is so insignificant. But remember Jesus’ comment about the widow who gave two copper coins; “I tell you that this poor widow put more in the offering box that all the others” (Mark 12:43). 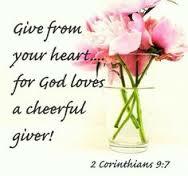 God sees what you give, and looks to people to give generously “for God loves a cheerful giver” (2 Corinthians 9:7). For many, the principle of a tithe (10% of income) is a useful measure. The Bible teaches that God, who richly has supplied us with all good things, wants us “to be generous and ready to share” (1 Timothy 6:18). Giving is intended to be a joy and a blessing, both a response of gratitude to God and a commitment to God’s work. So, the generous giver might give well beyond the 10% of the tithe. The example of St Francis is what should inform our thinking about how much we should give.